Hot on the heels of our big 4.1 release is a minor 4.1.1 primarily intended to fix a few bugs. However, we did manage to sneak in one really useful feature that makes formatting your graphs and maps incredibly flexible. Yes, it’s a mouthful, but it’s also incredibly powerful. You’re now able to use saved queries to select the entities and relationships you want to format on a graph or map. This includes text similarity searches, related searches (aka search around), and of course normal boolean queries too. The screenshot below shows two different formatting rules applied via saved searches. 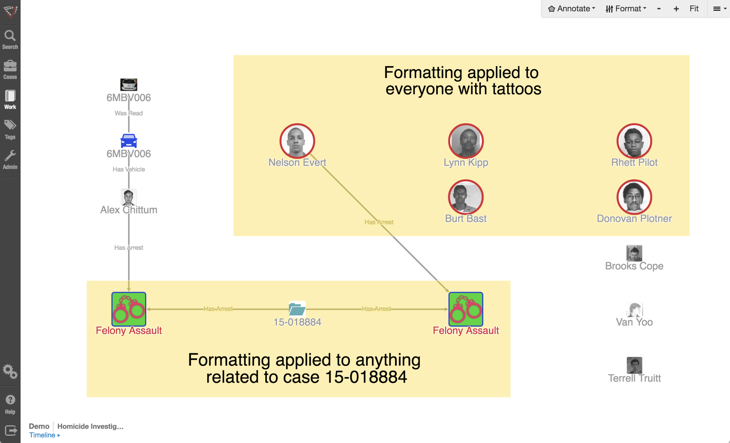 The formatting rule at the top of the screen is resizing and adding a circular red border to all individuals with tattoos. The formatting rule towards the bottom is enlarging, adding a blue border, and applying a green background to entities with a relationship to case 15-018884. The new query-based conditional formatting makes it easy to be very precise about what you want to format. Want to see it in action? Request a demo today!